Not a fighter but want to train like one? Certified MMA Conditioning Specialist Shannon Vick will teach you the basics of Self-Defense and help you condition your body at the same time. This is a full body workout that includes boxing and kickboxing and will get you fit and feeling confident. Join today! If you've ever wanted to try Boxing then there is no other place better than Iron Fist Fitness! In this class you will learn from long time Boxing Instructor Shannon Vick as he teaches you proper technique and the basics of boxing. You will walk out each time feeling confident. So sign-up today! Yoga is a type of exercise in which you move your body into various positions in order to become more fit and flexible, to improve your breathing and to relax your mind. This class is for everyone of all levels! Dance to great music, with great people, and burn a ton of calories without even realizing it! A fun filled class consisting of hip-hop, soca, samba, salsa, merengue and mambo. So if you're looking to dance, get fit, burn calories while having fun and making new friends then this class is for you! Gritt is a class designed to condition and strengthen the whole body. The concept of this class is to tone and sculpt the muscles while increasing your cardio using jump ropes, kettle bells and calisthenic exercises for a full body workout! Looking to learn how to properly strike? Certified Kickboxing Instructor and Specialist Shannon Vick will help you accomplish just that! This class incorporates the fundamentals of Kicking and Boxing, that will help you become efficient in striking. Students will always learn new techniques that will help you gain knowledge and confidence that will leave you empowered. Sign-up today! Drench is a new class that consists of weight specific exercises using the method of low weight high reps. This class is a full body workout designed to sculpt, tone and shred body fat in those hard to reach areas of the body while adding lean muscle. Burn calories while shedding pounds and leave completely DRENCHED! Xhaust is a calorie burning, high intensity workout that is designed to improve your overall strength & conditioning, as you push yourself past your limits. 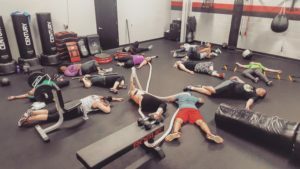 This class includes tabata, boxing, core stability, jump rope, ball slams and much more for a total body workout that will leave you exhausted. This isn’t your normal class so be ready for the challenge and see for yourself the many benefits Xhaust has to offer as you will experience a transformation like never before. Open gym is for IFF Members only to come train, hit the bag, work the core or hit the weights. Certified personal trainer Shannon Vick will be on hand if you have any questions.